Have you ever started a body cleanse and then gotten frustrated as you went through the process because you weren’t sure what to expect next? If so, I highly recommend learning more about DR-Cleanse because with this program you have an actual cleansing coach, Denise Raimi to help you make the most of it and achieve “optimal performance levels.” I have tried cleansing in the past in order to release the toxins in my body but have been sure if I am doing it correctly. Are you wondering if a body cleanse may be right for your overall wellness? If so, you can learn more about the “5 Reasons You Need to Cleanse” at the DR-Cleanse website. For your body cleanse, you can choose from a 9-day, 30-day or maintenance program which uses a specific combination of products from Isagenix®. I enjoyed a sampling of several Isagenix® products including Slimcakes®, Natural Orange-Flavored Electrolyte Mix, IsaLean® Shake and an IsaLean® Bar. The products are very tasty and I appreciate that Isagenix® products are made with natural ingredients and flavorings as opposed to artificial products that I have seen included in other brands of shakes, bars and drink mixes. My favorite product that I sampled is the fiber rich Slimcakes® which is a delicious cookie made with oatmeal and berries and it has less than 100 calories. It is a very filling and satisfying treat or snack. 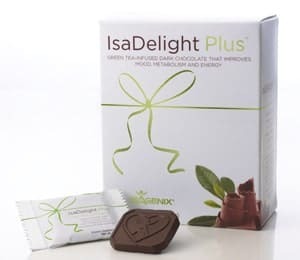 Another personal favorite is the Isagenix® dark chocolate, the IsaDelight Plus. It contains green tea within the rich, luxurious chocolate that is perfect because it is not overly sweetened letting the cocoa shine through this product. You are encouraged DR-Cleanse website to learn more about the program, read personal testimonials and begin your own program. One lucky reader will receive a goody bag full of samples + 1 free coaching phone call from DR Cleanse valued at $25. I learned 2) More than 700 chemicals (including prescription drugs) have been identified in our water supply. I learned that headaches during a cleanse are usually caused by caffeine withdrawal. I learned that there are over 700 drugs in our water supply. Holy crap! I couldnt believe the number of chemicals in our water supply, that is very scary.. I learned that thousands of chemicals enter our bodies just from our water supply alone. This is frightening. I learned that thousands of chemicals enter our bodies just from our water supply alone. I learned caffeine can cause headaches. Not sure about the body harboring so many toxins, the research doesn’t support it. But I am interested to try for myself! Cleanse rids your body of harmful toxins. I learned that cleansing is not the same as dieting. I like the idea of losing weight by eliminating impurities and reducing unhealthy cravings when doing natural cleansing. I learned that we are full of loads of toxins. I knew we had some but never that many!!! wow! I would love to try this. caffeine can cause headaches? I thought it cured them! I learned that headaches from a cleanse are cause from caffeine withdrawal usually.